Good gun depression and compact turret. Solid alpha and penetration with rather good aim time. Acceptable mobility for a heavy tank. Due to its fairly thin armor, it is recommended to avoid taking fire whenever possible. Sidescraping is good with the 50mm side plate and should be used whenever the situation calls for taking hits or holding a choke point. Hull down is also effective due to the top turret being fairly well armored with a good mantlet but cannot be relied upon to block any guns with high penetration such as those used by tank destroyers. If caught in the open, try to angle the tank at approximately 40-45 degrees to the enemy. Although it appears that the tank is a square box, the hull is really a rectangle. Angling at 45 degrees shows too much of the side armor. To compensate for the long side armor, angle towards your enemies with the gun pointed over the fender/corner. With proper angling the tank becomes somewhat resilient to many guns that normally could pen the front head on. Other DW IIs find it very difficult to penetrate if you angle effectively, or are not shooting APCR "gold" ammo. 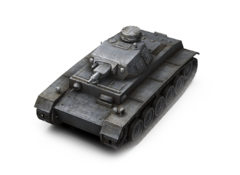 The tank is best used at medium ranges, as the most accurate and effective weapon, the 50mm KwK 39 L/60 lacks the accuracy to be effective at extreme ranges but can hit weakspots from close to mid range. The 75mm KwK 37 L/24 is best used in short range fighting, but is generally not the preferred choice due to low penetration for a tier IV heavy tank. Overall this tank should be played as a support heavy as its armor and maneuverability are both lacking. The guns have low penetration but can be viable when targeting weakspots or using APCR. Stay behind the main push, let heavier tanks take damage, and support the team. This page was last modified on 22 April 2016, at 07:56.